Glossy glass. Gleaming aluminium. And a gorgeous design. 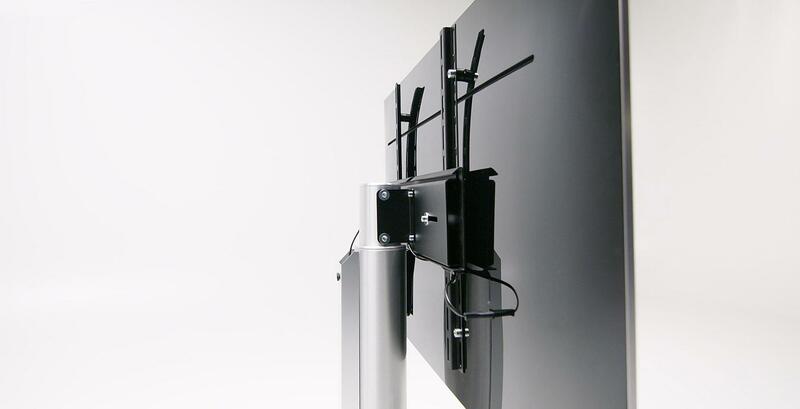 Our carefully crafted Panel models are equipped with a pivoting TV mount where cables are concealed in the column. A choice of three widths is available. The Panel models make television possible from every angle thanks to their rotatable TV mount. Small and mobile. The only 61cm wide PL60 is the ideal TV table when times narrow. The open design offers enough space for any type of player and TVs. The universal TV mount is suitable for any TV. The PL60 is the space-saving and mobile solution. Models PL151 and PL181 are made with felt glides and a rotating universal TV mount. Models PL152 and PL182 are made with felt glides and a rotating universal TV mount. Download the Panel product portfolio in pdf format.